like a leader? PLUS LOTS MORE! 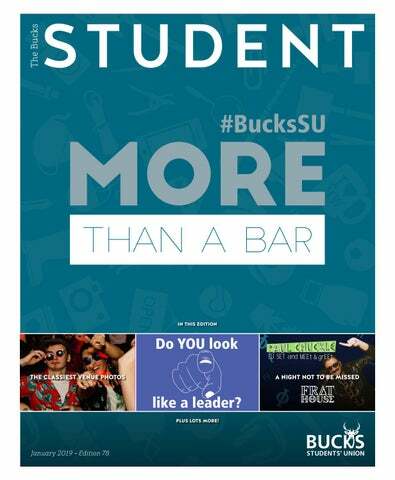 EDITOR'S INTRO The #BucksSUMoreThanABar competition is back! Previous prize pools have gone as high as £200 and beyond!. Find out how you can enter on page 5.
journeys but what will this year mean to you? For me 2019 is going to be the year I (hopefully) graduate, (definitely) adopt a bunch more cats and (maybe) figure out what I want to do with my life. Who am I kidding, I don’t know what I want for tea tonight let alone what I want to do with my life. make the most out of your university experience. society, make 2019 the year you do it. What a busy first term we have had, with students getting involved in lots of different activities. All student based councils have been busy, discussing matters such as mental health, bystander intervention, and sexual harassment. Welcome back! I hope everyone is feeling refreshed after the break and ready for the new term! People always used to tell me that time flies at University but I think as a Sabb the days and weeks just disappear. I hope you all had a relaxing break and are refreshed ready for semester 2! We have got so much to look forward to with RepCon (Wednesday 20 February), It Starts With You and #BucksSUMoreThanABar! I’ve got a couple of exciting things to share with you all! The car parking trial that we rolled out last term has been approved to continue! This means for those of you who had permits last term will need to pop into the office to collect a new one. These new permits will last until Easter and the scheme will be reviewed by the University again then. #BucksSUMoreThanABar is such a lovely campaign because it gives you the chance to tell us how you’ve been involved during your time at Bucks. I got involved by working behind the bar and from that I learned lots about what else the Union offers. I then got elected as a student rep, RAG ambassador and now VPEW! My second exciting point is regarding the National Student Survey which is filled out by undergrads at the end of their three years! The University has agreed to donate money to our RAG charities if 80% participation is reached across the different course areas. If all areas hit the 80% participation target over £2,000 will be donated from the University to RAG! I’m so eager to see what this term has to bring and of course I’m excited for ELECTIONS to see who the new student leaders will be! If you guys have any idea big or small on how we (The Union) or the University could improve or change, don’t forget about Student Ideas. This is a forum for you to propose new ideas with the support of a Seconder, which will be bought to Union Council and discussed whether we (Sabbs) should take it forward. The second term will also be filled with great opportunities for students to get involved in, the biggest of these events being Varsity. Varsity is the single biggest event that is run by the Students’ Union selling over 500 tickets. This year we travel to face Roehampton in their own back yard, with both Universities battling to win the prestigious Roebuck trophy. Last year Varsity ended in a draw, with Roehampton retaining the trophy as a result of their 2017 victory. Varsity is a great day to be a part of, whether you are a player or spectator, make sure you buy your tickets from the Bucks Students’ Union website as soon as you can, you don’t want to miss this event. Post on Twitter or Instagram by filling out a comment card. 10 February comment card or online entry will be drawn at random. Do YOU look like a leader? #BSUElections It’s hard to believe that we’re at this stage of the year already but Elections Time is Coming and nominations for the 2019/20 elections are now open! There’s so many different student leadership positions on offer so this could be your chance to get involved and make a real change. Mature (starting your course at the age of 21 or above), Part-time and Postgraduate Executive Officers, are all based on your point of entry to the University. The Executive Officer roles are all voluntary positions and are performed alongside your studies. Do you look like a leader? Think you’ve got what it takes to lead the Students’ Union? Then why not stand for one of our three sabbatical officer roles - President, Vice President Education and Welfare and Vice President Student Involvement. All of these roles offer an individual the opportunity to direct the work of the Students’ Union during their time in office meaning you can make the changes you want to see. It’s set to be a hotly contested election this year so make sure you get your nominations in early in order not to miss out. There are three Student Trustee positions available as three of our current Student Trustees are final year students and will be vacating their posts at the end of this academic year. The position of Student Trustee is a unique opportunity to part of the team driving the strategic direction of the Union. The Student Trustee roles are part time volunteers who fulfil the roles alongside their studies. Whilst our Sabbatical Officer roles are probably the most high profile during the elections period there are some other very important positions within the Students’ Union that are also up for election. Each year, the National Union of Students hold their annual conference and three representatives from Bucks are sent to be your voice. The delegation leader is the Union’s current President but the other two NUS Delegates are elected. One of the three roles is reserved for a woman and as our delegation leader defines a woman, the two elected positions will be open to all of our members to stand. Finally, we also have our student rep positions up for election. Student reps are the Union’s eyes and ear at a course level. They act as the figurehead for their class or group and help us to get an understanding of the student experience as well as identifying if any changes need to be made or good practice needs to be highlighted. Want to help make the changes you and your peers want to see on your course? Nominate yourself to be a student rep now! Frequently Asked Questions 2. How do I go about standing in the elections? We know that the elections process can be confusing and so to help with this, we’ve put together some Frequently Asked Questions from our annual elections and you can find these below. If you have a question that’s not included below and would like to know more, do not hesitate to get in touch with a member of the team at surepresentation@bucks.ac.uk. 1. Why would I want to run in the Students’ Union elections? All of our student leadership positions offer an individual the chance to improve the student experience across the university and this means every individual will have a different set of skills they can bring to each role. So whether it’s ensuring we have 24-hour library access, improving services on campus or removing hidden course costs, being a student leader gives you the opportunity to make the changes you want to see. All of our student leadership positions also help to boost your employability prospects and with the competition for jobs becoming even tougher once you’ve graduated, standing in one of these roles can set you apart from the rest. you’ve got everything you need to have the best possible chance of success. If you’ve got any questions throughout the nominations and elections periods, you can always touch base with someone from the representation team and they will be more than happy to help. The representation team will also be in regular contact with you throughout these periods and will regularly provide you with key information meaning you’re constantly up to date. 5. Who can I speak to if I’m interested in running in the elections? Just pop into the Students’ Union offices at either our High Wycombe or Uxbridge campus and ask to speak to someone from the Representation team. 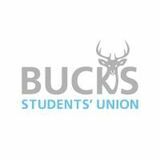 Alternatively, you can email surepresentation@bucks.ac.uk or visit bucksstudentsunion.org/elections to find out more information about any of the roles available, how to nominate yourself or any general queries. Here, you’ll also find some more of our FAQs. Give it a Go 2.0.
our second Give it a Go week of the year. you can try out as many societies as you can make it to without any commitment. participation and help you join in. Our competitive sport programme runs throughout the three terms at Bucks. new people, while giving back to the community! anyone can come and play. We offer many different sports from Volleyball to Karate, or Badminton to Dance so there’s something for everyone! up for in advance so be sure to do so at bucksstudentsunion.org/whatson. available throughout the course of the week! Have you thought about next year’s accommodation yet? It might be scary, but it's good to tackle it early! First of all, don’t panic! Time’s really not ticking. A lot of students worry they won’t be able to find accommodation but due to changes in the market in High Wycombe, there is now more accommodation than students, so you have plenty of time and even more choice. Also, the university now offers halls rooms to 2nd and 3rd year students! Looking for accommodation can be a scary prospect when you’re trying to focus on your studies. Don’t forget that the Advice Centre and the Accommodation Service are here to help you! I loved living in halls but I also loved living in private accommodation, sometimes. When I moved into my second year house, it was dingy, expensive and I never felt that safe there. I never experienced those feelings when I was in halls! Don’t forget that everyone’s experiences are different. Pick a choice you’re really happy with! If there was any advice I could give to you because I’ve been through it all - Don’t let landlords or lettings agents take advantage just because you’re students! (By choosing to live in halls, you’d never have to deal with this as accommodation take care of it!) We asked the Accommodation Service your questions, here’s what they had to say: Georgia: Can I live in halls next year? Accommodation: Yes! The Accommodation Service will be advertising rooms in the halls in February. G: If I want halls, do I have to pay anything now? G: What if I don’t want halls? A: Yes, you will need to pay a £300 prepayment. It isn’t held as a deposit and will be turned into rent and used to reduce your final invoice in 2019/20. A: If you do decide to look for housing in the private sector, you will be asked to sign a contract. The Accommodation Service have trained staff that can look over your contract and identify any potential issues which might end up saving you later. G: But what if I want to live with friends? A: That’s OK! We can place you in groups in the halls, so you can still choose to live with your friends. If you don’t have enough people to fill a whole flat, we’ll put other people in with you to fill the flat. G: I don’t want to live with first years! A: That’s OK, too. There can always be exceptions, but we try to place 2nd and 3rd year residents in different flats to 1st years. G: But the rent is higher in halls, isn’t it? A: Well, it’s a common misconception that it is more expensive, however it can look that way sometimes: • The halls contract is for 42 weeks, many private houses run for 51 or 52 weeks, so you could end up paying for rent over summer when you’re not living there. • The halls includes all the bills – electricity, gas, water, contents insurance and Wi-Fi, in many houses, this would be an additional cost. • In halls there is cleaning in communal areas, you normally wouldn’t get that in other accommodation. • In the private sector you can be asked to pay a refundable deposit, which can be as high as £600 or £700. G: Is there anything else I should think about when looking at student housing? A: Yes…. • The University and Students' Union have a good relationship and work closely when we need to in order to try and ensure the best outcomes for our students – private landlords don’t have to do this! • You’re better off with the University if you have financial issues. The university can be flexible with you if your loan is late; private landlords don’t have to do this and you will often need to • If somebody drops out of your group then the University won’t hold the remaining residents responsible for the rent, a private landlord can, because most of the houses are rented on joint contracts. • We don’t ask your parents to be guarantors, many private landlords/agents do. • If you stop being a student, the University will release you from your contract, private landlords do not have to. So I hope this has helped you stopped panicking and shown you some options for next year! Feel free to come and have a chat with any of us! Or email: georgia.nosal@bucks.ac.uk, suadvice@bucks.ac.uk or accommodation@bucks.ac.uk. Your unique offer, and how to match it to recruiter needs Students at Bucks are diverse – you have unique skills and passions, and also a unique set of characteristics. This may include coming from a black or minority ethnic background, having a disability (which could include autism/aspergers or a specific learning difficulty such as dyslexia or dyspraxia). You may identify as LGBTQI. In some sectors there is still not a balance in gender representation. So can these create barriers to getting a graduate level role? For individuals the CIPD says that “the moral case for building fairer and more inclusive labour markets is indisputable”. The CIPD also looks at the commercial benefits of ensuring diversity in the workplace; “everyone stands to benefit when we embrace and value the diversity of thoughts, ideas and ways of working that people from different backgrounds, experiences and identities bring to an organisation”. Do words make a difference to recruiters’ actions? Organisations may sign up to specific initiatives such as “Disability Confident” or “Stonewall Global Diversity Champions”. Behind the scenes these employers will be undertaking monitoring and taking accountability for improving the diversity of hires. Some larger employers are now anonymising applications before Recently some students suggested to me that sometimes they reach hiring managers. With this approach it feels that this kind of positive action is merely paying personal information such as name, residence, lip service to the issue. What is the truth? Should we take university and sometimes even grades are removed companies’ diversity and inclusion efforts seriously? before they reach decision makers, meaning that your How can you identify recruiters who will take you personal statement becomes your most persuasive tool. seriously, for your skills and talents? Employers in sectors where there is acknowledged There are two angles to the discussion; both of which underrepresentation may engage in specific the Chartered Institute for Personnel and Development campaigns, and there are even recruitment agencies (CIPD) highlights. specifically focused on niche markets. There are laws in place to ensure everyone is guaranteed a fair chance when applying for jobs, regardless of personal characteristics. In addition some companies go further in trying to ensure fair access, and promote their opportunities with some kind of “diversity” tagline. an edge (e.g. Change 100, CharityWorks, EmployAbility, Creative Access) Don’t forget to check out the MyBucksCareers newsroom for great articles related to this topic mybuckscareer.careercentre.me/ resources/newsroom/newsroom.aspx and book a chat with one of our careers consultants at careers@bucks.ac.uk to find out about more opportunities, and how to apply. STUDENT ACTIVITIES Welcome back to all of our Buck’s Students, we hope that you had an amazing break and are ready to take 2019 by the horns and have an extremely successful year. We’d like to take this time to also wish everyone taking part in January exams Good Luck, you have got this! West End Musicals and Theatre Productions – You asked, and of course we delivered! This term will Term 2. This is the term where you as students begin continue to see more trips to West End Theatres as to realise that the end of the academic year is fast approaching, this term tends to fly by! Have you made the well as our local Wycombe Swan theatre to see some most of your student experience during your time here? amazing productions! How many FREE developmental and recreational activities have you taken part in? Do you have something different in mind? If you have an activity or skills training sessions that you would like to take part in, please do not hesitate to get in touch! We love hearing Student’s ideas and providing opportunities that you want! Contact your activities team via email: surecactivities@bucks.ac.uk or pop down and see us in the Students' Union offices! Caroline, or Change – Tuesday 29 January – Following How many FREE Certified Skills training sessions have it’s sold-out runs in Chichester and at the Hampstead Theatre, this beautiful Musical has made its way onto you taken advantage of to boost your employability the West End stage! Based loosely on a true story and add to your transferable skills set? Caroline, or Change is set in Louisiana in the 1960s It’s not too late to change and to that number! where the character Noah is struggling with the death Bucks Student’s Union is here to make you the best that of his mother, and his father’s remarriage to her best friend. He spends his time with their maid, Caroline, you possibly can be, by providing opportunities to you, who works in the family’s basement. Caroline, who has for FREE. a family dependant on her, faces a moral dilemma when We look forward to seeing you all on as many courses This term already has some amazing sessions booked a novel opportunity to fund her family presents itself. as possible this term! in and there are more to come! Everybody’s talking about Jamie – Wednesday 13 #BucksSUMoreThanABar Please see below for a list of some of the upcoming Skills February - Inspired by a true story, Everybody’s Training Sessions and Developmental Activities that we Talking About Jamie is the new hit musical for today. have coming up. Be sure to keep an eye out on the Bucks Jamie New is sixteen and lives on a council estate in SU ‘What’s On’ page to keep up with our regular weekly Sheffield. Jamie doesn’t quite fit in. Jamie is terrified about the future. updates. bucksstudentsunion.org/whatson. Need to let off some steam after all of that revision? We’re providing you with a trip to Rush Trampoline Park, transport included on Friday 1 February! Raise and Give (RAG) is a way that we raise money for charities throughout the year. As you hopefully know by now, our two RAG charities this year are: Wycombe Homeless Connections and Hillingdon Samaritans. So far, we have done amazingly for RAG this year and I thought I would take this chance to give a little review of what we have succeeded and a little more about my role as RAG Ambassador. I’d like to start off by thanking all the students who have got involved and have committed their own time to help these charities, as well as many other charities throughout the year. During our freshers’ fortnight we have had over 300 votes, which is brilliant. However, we want to encourage as many students to get involved as possible. In March, the recruitment will start to find a new RAG Ambassador and I fully encourage anyone to take on the role. There are so many skills and attributes that come with the role, such as confidence. Finally, I want to say a big thank you to Kat Frei for everything she has done since I stated my role and for being a huge support system throughout the events we have organised. So, a little more about my role. As RAG Ambassador I have had the opportunity to get involved with so many fun and exciting events that not only we have planned but students have come to us in cooperation with RAG. Our RAG week was a great example of this, and it was so successful that we are planning another one very soon, so keep a look out! My role is to raise awareness, help students with their fundraising ideas and liaison between them and the Students' Union. When I ran for RAG Ambassador last year, I never thought I would win, I even considered dropping out of the election. However, I stuck to it and here I am. Since then, it has been non-stop, but in a good way! I don’t just like my role as RAG Ambassador - I love my role and I am so happy that I stuck to it. I get to socialise and plan so many interesting events with so many different students, which has made my university experience so much more worthwhile and exciting. Being an events student, the role has given me a chance to develop and gain skills, which I can put on my CV and will help me excel in my career in the future. I can now take on a leadership role, as well as have better control of time management and a better understanding of how events are and should be run. I have also gained more friends and enjoy seeing more familiar faces around uni that I can have a quick catch up with. RAG has also thrown me more into a volunteering role and I have now given up my own time to volunteer for charities, such as One Can Food Bank. VOLUNTEERING Nominations are open for RAG, Green and Fairtrade Ambassadors 2019-20! Every year we have students leading on Students' Union projects; raising awareness of key social issues, lobbying the University to improve student lives, and empowering other students to get involved. These students gain vital employability skills; from time management, public speaking and networking. We have several opportunities available which would suit students with different interests and passions; RAG Ambassador This role would suit any student who is passionate about charitable fundraising, who has creative ideas and enjoys working in a team. One of the biggest benefits is you have the opportunity to attend the annual RAG conference. At the 3 day conference you will get to choose from a variety of workshops and seminars, exploring different aspects of fundraising and hearing from inspiring speakers. You also get to learn about how other Universities run their RAG fundraisers and get students involved. The conference ends with an awards ceremony with a three course meal, where you get to celebrate the achievements of student fundraisers across the UK. The role involves supporting our two RAG charities (voted for by our students), coordinating fundraising events on campus and spreading awareness to students and staff. How you want to do this and how much time you want to give to RAG is really up to you, we just ask that you are committed to the role and delegate to volunteers when possible. Our current RAG Ambassador, Claudia Waghorne, ran our first ever RAG week, raising over £700! She encouraged some of our sport’s clubs to run events that week, talked about our charities at the events and got students to volunteer to help out throughout the week. She was also part of team that run the successful Christmas lunch for the residents of Rye View Manor, turning our Venue into a beautiful festive scene! She has done incredibly well and would be happy to talk to any students looking to apply for next year. Check out her own article in this month’s edition! Green Ambassador This role would be suitable for any student who is passionate about sustainability. Whether that be caring strongly about climate change, deforestation, over use of fossil fuels or animal extinction! The student would work closely with the Activities Coordinator (Volunteering & Fundraising), supporting their completion of the NUS Green Impact accreditation which aims to make the Union more sustainable and educates students on how to do this. The student in this role will be given the opportunity to attend meetings to hear from University and Union staff about how they are tackling sustainability issues on campus. You will get the chance to put forward your ideas for change and gain support in putting these into action. The current Green Ambassador, Darren Hannay, is working on a campaign to reduce paper use at University which has already had an impact on the Union who are aiming to go paper free in future meetings. Fairtrade Ambassador This role would suit any student who is passionate about Fairtrade and would like to be involved in spreading awareness. This could be through running campaigns, putting on events or inviting in guest speakers. In the past the student in this role would get involved by running activities throughout Fairtrade fortnight or choosing to spread events across the year. This year’s Ambassador, Emily Dixie, is planning on running the Smile Campaign. This is an annual event which spreads the message of Fairtrade to local commuters, whilst also spreading smiles throughout the town! In all of these roles there will be an opportunity to access funds for campaigns and students will receive close support from the Activities Coordinator (Volunteering & Fundraising). For more information on any of these roles or to nominate yourself, please visit our website; bucksstudentsunion.org/elections. Any questions please email volunteering@bucks.ac.uk. , fRESHERS Saturday 2 Saturday 9 February WEEK! TIME TO TALK Hello, our names are Ellie Freeman and Laura Bailey. We are students currently working for the Students' Union as School Officers for Art, Design and Performance (EF) and Aviation and Security (LB). We want to spend our last year at University ensuring Bucks is a safe and supportive environment for all students, sharing our knowledge and passion for positive mental wellbeing. Did you know, one in four students struggle with their mental health whilst at University? This can make day to day tasks difficult and we want everyone’s experience at Bucks to be the best it can be. The stigma of mental illness is something the Student’s Union, and University as a whole, are trying to fight. On World Mental Health Day, the “Break the Stigma” campaign took place in the link bridge. Additionally, this week the ninth #BucksStudentWins was announced – “We have trained 29 mental health advocates to support members of clubs and societies”. We want to encourage students to talk about mental health, without fear, in a safe space. During RepCon, we will be running a session called “The Elephant in the Room”, covering the most common mental health struggles amongst students and tips on how to support yourself, peers or anyone that may be struggling. It’s an interactive workshop, with a chance to get to know your fellow reps better and learn together how to best deal with the pressures of University positively. We will be discussing shocking statistics, top tips and motivational messages to help start the conversation. There will also be a leaflet to takeaway with information on how to get support for any mental health struggles, both on and off campus (there’s also a chance to win a prize!). It’s time to talk about mental health. We want Bucks to be a place where everyone has someone to talk to, whether that’s a friend, course leader or the counselling services. This year, the University is taking part in a campaign by Time to Change, a growing social movement working to change the way we all think and act about mental health problems. This campaign is “Time to Talk Day” on Thursday 7 February - The University and Students' Union are teaming up to run an event in the Study Lounge, with the idea being to get the conversation started at Bucks about mental health. This will run from 10am-1pm, with free tea, coffee and biscuits to have, or takeaway to share with your friends and start a conversation. By speaking about mental health issues, we are helping to break the stereotypes, improve student life and end the stigma of something that affects so many of us. You don’t have to be an expert to talk about mental health and there are many ways to start the conversation. Whether you come to support the campaign on campus, share a post on social media or just ask a friend how they are, make sure you have a conversation about mental health this Time to Talk Day. VEGANUARY Don’t worry I’m not going to talk about the sausage roll thing because we all know just how upset people got over it but in case you were wondering it was great. unsuccessful in the past. A big part of Veganuary for me was making sure I prepared healthy and nutritious meals that both me and my boyfriend would enjoy which would also give us plenty of energy to go to work. Some of our favourite meals which we prepared together were chilli, chickpea curry and mac ‘n’ cheese which can all be found on bbc goodfood if you fancied having a go at making it yourselves. The only slight negative I found whilst doing Veganuary was having to constantly check the ingredients section on every product that I bought which was also annoying when I forgot to take my glasses shopping with me. However, I quickly got used to doing this and it became a part of my shopping routine in no time at all, even my boyfriend got used to having to check products for me just in case I missed anything. Veganuary gave me the opportunity to try out being a vegan alongside many other people all over the world which was exciting as we could all follow each other’s journeys. After going vegan for January, I have decided that it is something I want to do on a permanent basis therefore I am going to try to be vegan indefinitely and I am really looking forward to continuing my vegan diet and enjoying all the benefits that come with it. Congratulations to everyone who was successful in completely Veganuary and good luck to those who will also be carrying it on. comedy. Unusual camera shots are used which makes this film unusual to watch as you are watching all the action unfold from a corner of a room instead of close up to the action; however, at the heart of this film is a love triangle. Colman initially is a comedic character. With her unusual characteristics and behaviour she comes across as childlike. As the film goes on and we learn more about the Queen, the reason behind having 17 rabbits makes Colman’s performance special. As a result, this must have been a difficult character to understand and portray but Colman does it really well; it's no surprise she's already winning awards for this role. Weisz's portrayal of Sarah is very blunt and head-strong and the opposite of the Queen which is great to watch as Sarah is in control of the relationship, even though the Queen has more power, she’s just too ill to know how to use it. Abigail starts off as a character you enjoy watching and you feel bad for her as she is trying to survive but once she becomes the Queen’s favourite, the character completely changes as she gets what she wants which is power. This film is a struggle for power and keeping the power the gain, but it shows how easily power can get taken away. All three actresses are great and perform at the highest level. This film is emotional one minute and humorous the next. It doesn’t have the ending you would expect but it is interesting to watch as there are political mind games, secret affairs, duck racing and lots of rabbits - what's not to enjoy? This film might be different to what you usually watch but definitely worth a watch. Cosplay and Craft Society is a friendly society where we meet on a regular basis to do Cosplay related activities like costuming and skills workshops, and small little craft projects like Hama beads and resin jewellery, all while chilling eating sweets! (Trust us, the sweets eating part is VERY important to the session… honestly…). This post will give you a little insight of the who, what, when, where, and why of the society so you know what you need before you join! What? Chair: George Sleeth George is a second year Games Development student. He is the guy in charge. He’s the one that helps finalize decisions on what the society want to do. He runs it and makes sure everything is going well. Fun Fact: He used to play wheelchair basketball for his home county team. Secretary: Lewis Boyling Lewis is also currently a second year Games Development student. Along side George, Lewis makes sure that is everything is running well. He’s his second in command. Lewis looks after all the paperwork and registers and makes sure all the admin is taken care of. Fun Fact: He is fluent in Sign Language. Okay, so what do we have coming up in Cosplay and Craft society? Well, what I am an illustration student and I am we are planning to do workshops to in my second year of the course. I originally assisted with getting things cover as many skills as we can so that we can cater to everyone’s needs! Some started with the society as well and workshops will included wig styling, advertising it around when it first Hama Beads, and sewing tutorials. started. Once everything was off Along with these, there’s so many the ground, I took the role of society Treasurer and have held that position more! If there’s something you want to try or there’s something you’ve always for two years. I take care of the wondered about cosplay or crafts, finances of the society, meaning that come chat to us and we’ll happily see I make sure that the money that the society receives benefits them as much what we can do! as possible. We’ve also got our Takeover coming Fun Fact: I love dogs so much that I’ve up! We chose to do a night at the movies with food inspired by different paid £13 for a subscription service to films and having a little sofa and bean walk other people’s dogs. bag area where you can chill out and The three of us keep the society eat (something we really enjoy doing!) running and make sure that everyone so save the date: Mon 11 Feb! Get some in the society is happy and feel free food and hang out, it’ll be great! welcomed, and so far, no complaints! Where? Where do we meet? We meet every week in N3.09 and N3.10. However in the odd chance that things change, we'll let you all know! When? Every Wednesday, 5-7pm. Why? We do it because we love it! We felt like everyone who was interested in costume making or crafting deserved to get a definite couple of hours a week to relax, costume, craft, or even just to chill out! We wanted to create a calm and relaxed atmosphere for students to hang out and have some fun. As a society, we love new members! We’re always welcoming fresh faces into our group as we love getting a new look on what we love! We’re always taking ideas for sessions, we’re always welcome to suggestions, this society is for you and interests! Just let us know! You can find out more about us as a society and any information that you may want via our Union page or if you want to come and try it out you can come visit us during Give it a Go 2.0 on Wed 13 Feb! EQUESTRIAN SOCIETY It has been a busy year for everyone with the BNU Equestrian society! Once again, we have had the opportunity to take different students each fortnight for an hour lesson at The Grove Riding School. The horses have taken amazing care of our riders and in turn our riders have excelled greatly. We had one rider move up from the beginner group last year to the advanced group this year! Despite the lessons only being every two weeks, I am glad everyone has had fun learning about these gentle beasts! As the semester continues, we are hoping to make a trip up to The Horse Trust, in Princes Risborough, to see the retired service horses and donkeys. THIS TRIP IS FREE! The Trust is only open from 2-4pm every Thursday, Friday and on weekends. Keep an eye on Facebook to have a say in what day we go! For more information, please go to our Facebook page @BNUHORSERIDING and give us a follow! This trip will be on a first come first serve basis due to having to organise travel. If you would like to sign up for our riding lessons, or have any ideas for trips, socials and events then please email either me at brittanijennifer@gmail.com or Beth Trevis (Our Sport for Fun ambassador) through our Facebook page. We would like to thank everyone for their support over the three years we have ran this society, and hope that this support will continue once Beth and I graduate. We wish all of the students here at Bucks New University a Happy New Year, and best wishes in their exams, coursework and dissertations! Everyone has had fun learning about these gentle beasts! from outside the D or you can use your three steps to take off from outside the D but as long as the ball is released before you land inside the D, it is not a foul, making the game dynamic and entertaining, as well as a good workout and great for the social aspect of sports, which no doubt most of us love. There is so much to this wildly popular sport that, like for all awesome sports you would have to read a dissertation in that to fully understand it, but why not pop down and see for yourself? Every Tuesday from 7pm, we play in the Events Hall (The one you take those "lovely" exams), some of us play for Cardio, some for the social aspect and others to win, what will you play for? Come find out, and after, we often go for food/drinks and to chill, that is if we are not attending one of our creative socials. Truly something for everyone... See you there! THE GLOVES ARE ON! Have you ever thought of becoming physically and mentally stronger and making a better version of yourself? Then come and join our Boxing society. This is a sport that is out of the ordinary, you learn different fighting techniques and ways to defend yourself at any point in time. We also go through an intense exercise that will tire you, make you sweat and want you to quit, but at the end of the session, you will feel like you are on top of the world!!! On top of that, you will feel like you belong to a community and will not be marginalised by other members, everyone is treated equally! We have a professional trainer that trains us once a week and has worked with amateur champions and professionals as well. We will also work with the Students' Union to do some volunteering work like community services or whether we help the Uni itself. Don't worry, we will go out and learn more about the members, that can consist of partying at the Students' Union, going to a local boxing event, or watching a title bout at a pub. Anyone is allowed to join, there are no barriers set. All we want from our members is to have a good time, get in shape and take in the boxing atmosphere. Sessions are every Thursday from 6-7 pm at High Wycombe Warriors Boxing Club, Unit 3 Fryers Works, Abercrombie Avenue, High Wycombe. Occasionally we have a Minibus available but on foot, it's 15 mins to arrive. The first session is free and after that, it's ÂŁ2.50 a session. the money raised from the event will go to our two RAG charities, Wycombe Homeless Connection and Hillingdon Samaritans. In addition, third year Dance and Performance student led company ‘We Think Blue’, will be running a raffle throughout the day. The money raised on the day will go towards their charity Gala, ‘a Night on Cloud Nine’, which will be held on the Saturday 18 May, where all proceeds will go towards Buckinghamshire Mind. All nine of our BNU Dance competition teams have been working tirelessly on their routines since October and are very proud of every piece created – so, it would be amazing to have as many Bucks students and staff to support us on our home turf! Bucks Comp however would not be the same without the exceptional help from all the Volunteers, so if you would like to be a part of this amazing experience, please apply via the Students' Union website. We can’t wait to see you on Saturday 23 February 2019 in the Events Hall and be sure to look out for updates on all of our social media pages! BUCKS NEW UNI DA DA DA DA! Bucks makes a splash as a national Swimming Performance Centre Last July, Bucks New University was selected by Swim England, the sport’s national governing body, as one of five national Swimming Performance Centres. Bucks Senior Swim Squad reached several finals and are already ranked in the top 22 universities in the UK at the first attempt. Working in partnership with Wycombe District Swimming Club (WDSC), Bucks Students’ Union, and Bucks New University, the Swim England Performance Centre gives talented young swimmers the opportunity to stay in the sport while continuing their education. Five centres have been set up across the country, with Swim England Talent providing support with coaching and sports science services. The squad of six achieved some notable results. Jamie O’Connor (studying Music and Live Events Management) is a top 20 GB-ranked swimmer and his success in Sheffield (7th place in the final) ranked him as 11th fastest in the UK in 2018 for the 200m freestyle. place out of 90 teams in the 4x50m Free Relay, a remarkable achievement. Jamie Baxter and Jamie O’Connor were also both selected for the England South East Team to race at the Flanders Swimming Cup (19-20 January 2019) Paul Morgan, Head of School: Human and Social Sciences, said: To be selected by Swim England as one of the five new Performance Centres was a significant achievement. “To see such early success is excellent. Out of the five new Performance Centres, we were ranked third, ahead of two more established university programmes. “The partnership with the Bucks Students’ Union is an integral part of the future success of the programme and it’s brilliant to work closely together with the team." made by Jamie O’Connor in 400m Freestyle and James Baxter in the 200m Butterfly who represented the University to the highest standard while Stuart Eastwood gained PBs in 50m Freestyle and Butterfly. A special shout-out for the Men’s 4x50m Freestyle Relay who made the B final and were against fierce competition from likes of Olympian Duncan Scott. The team finished 10th in the B final and overall 20th out of 90 teams. Bucks FC this year and the run up to Varsity Bucks FC is the largest club here at BNU with five different teams over five leagues. So far this season our 1st team top their league (South Eastern 4A) by two points (12 points from six games), led by Jan Greenslade and in the words of the midfield maestro himself “the 1st team train just keeps on rolling”. Keeping that train on this line will be the focus for the remainder of the season. The 2nd team (South Eastern 5A) have had a tough 1st half of the season. Joe Hampton has had to battle through injuries. The same can be said for Luke Robertson’s 3rd team (South eastern 6A), they started with a fine 2-1 home win at the beginning of the season but have struggled to pick up points since. Something they are both fully confident will turn around. one, only for the game to be abandoned early due to an injury and the referee’s discretion. As a club we know we can go the full distance with five wins from five this year. Already this year against Roehampton, Bucks FC 4’s put in a 1-0 away win with a combination of a solid backline and a wonderfully taken goal by Sam Mendham. Our dominance as a club over Roehampton continued with Bucks Futsal crushing Roehampton 11-3 including an audacious Rabona finish from Joe Hampton. Flair, team cohesion and ability being the key to our win. That being said Varsity is no walkover and we feel that with the preparation and more to come during the run up to the big day on Wednesday 27 March that the confidence and belief in each other will keep on growing, not just as a club but throughout the University. WHAT’S YOUR PASSION? The Bucks Student newspaper is looking for current students to write articles - if you’re passionate about a subject, we’d love to hear from you. Can’t think of what to write? No problem! Join us at a Newsgroup meeting and we’ll give you a topic to write about. Our meetings are in the Study Lounge (at the back of Beats), email editor@thebucksstudent.com to find out when the next one is! Not only will you get your views and opinions out there, but being able to say your work has been published will look fantastic on your CV. For more information email the student editor, Eliza, on editor@thebucksstudent.com.